How to use an ergonomic mouse properly? A mouse is a part of a computer’s hardware device which allows users to control the movement of the cursor on the screen. It’s one of the most important parts of a desktop computer as you will not be able navigate it without having a mouse. Because it is one of the computer’s primary components, people tend to spend long hours using it. What many people don’t know is that prolonged use of a computer mouse can lead to problems such as muscle strain or inflammation and repetitive motion injuries such as Carpal Tunnel Syndrome. Experts understand the health risks that are associated with long hours of computer mouse use which is why they have come up with an ergonomic mouse. How different is an ergonomic mouse from a standard one? An ergonomic computer mouse has been designed by engineers, doctors and technology experts to be comfortable and easy to use so as to reduce fatigue and stress that it might cause not only to the wrist but also the hands, arms and shoulders. As it is more comfortable to use, users will become more productive with their work. The best ergonomic mouse will be able to provide you with a more natural grip and hold. This will help ease the muscle fatigue in your hand, elbow and arm. However, it is important that you choose an ergonomic mouse that has the right shape and size for your hand as this will vary with each person. When using an ergonomic computer mouse, your wrist will assume a natural position. This is contrary to a standard computer mouse which requires you to twist your forearm. 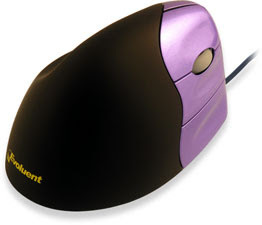 Because you will be using less effort and energy when using it, the mouse will reduce tension on your wrists and hands. The mouse should be placed near the keyboard to reduce the stress to your arms and shoulders caused by sitting in an awkward position. When the ergonomic mouse is close to the keyboard, it saves you the effort of having to reach forward which is one of the main causes of muscle strain. Your wrists and hands should also maintain a neutral position to prevent strain. This is usually similar to a handshake position. Don’t hesitate to adjust your keyboard, chair or desk to make your position more comfortable. You may also want to consider switching your hands while working on your computer. This is ideal because you can rest each hand and reduce strain. One of the most common mistakes people do when using the computer mouse is gripping it. With an ergonomic mouse, you can hold it gently so as to avoid having wrist or hand pain. While it is true that an ergonomic mouse has a lot of health benefits, it is important to make sure that you are taking enough time to rest. If you use the computer for long hours, relax your hands and arms regularly. It is through this that you will be able to notice the difference of an ergonomic from a standard mouse. This entry was posted in Info by Jack. Bookmark the permalink.